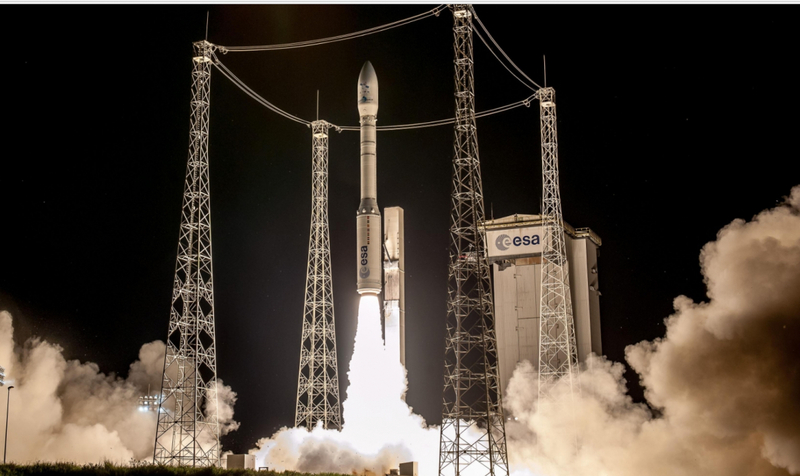 Europe’s Vega rocket has conducted its eleventh launch Tuesday, deploying Morocco’s Mohammed VI – A satellite following a late-night liftoff from the Centre Spatial Guyanais in Kourou, French Guiana. The instantaneous launch opportunity occurred at 22:42:31 local time (01:42 UTC). The Mohammed VI – A spacecraft is Morocco’s second satellite and the country’s first dedicated to high-resolution imaging. Named after Morocco’s reigning monarch, King Mohammed VI, the satellite is the first of two Moroccan imaging spacecraft that are expected to launch over the next two years. Mohammed VI – A is a 1,100-kilogram (2,400 lb) Earth imaging satellite which is expected to operate for at least five years. 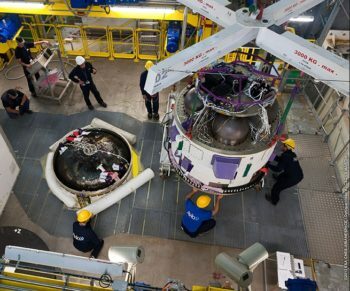 The second satellite, Mohammed VI – B, is scheduled for launch next year aboard another Vega – although Morocco has an option for a Soyuz launch should Vega be unavailable. Thales Alenia Space were the prime contractor for both Mohammed VI satellites. 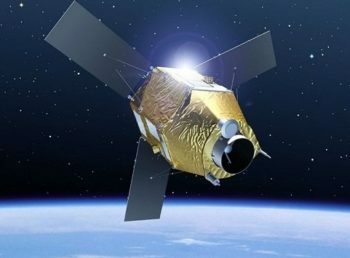 Airbus Defence and Space built the satellites around the AstroSat-1000 bus, while Thales developed the imaging payloads. While few details of the spacecraft have been made public, they are understood to be similar to the two Falcon Eye satellites that Thales and Airbus are constructing for the United Arab Emirates. Those spacecraft are derived from France’s Pleiades satellites, which carry High Resolution Imager (HiRI) payloads with a resolution of up to 70 centimeters (28 inches). Pleiades-HR 1A and 1B were launched by Soyuz-STA/Fregat rockets in December 2011 and December 2012. Mohammed VI – A is the second satellite to be placed into orbit for Morocco. The first, Maroc-TUBSat, was a joint project between Morocco’s Royal Centre for Remote Sensing (CRTS) and Germany’s Technical University of Berlin (TUB). It was launched in December 2001 aboard a Zenit-2 rocket, a secondary payload on the launch of Russia’s first – and only – Meteor-3M weather satellite. The Mohammed VI – A satellite was launched by Arianespace. 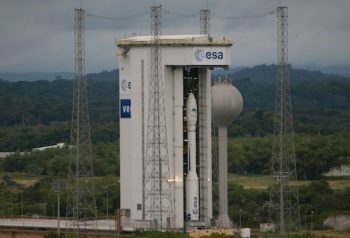 Vega, the smallest of the three rockets in Arianespace’s fleet, was used for the launch which took place from the Centre Spatial Guyanais – or Guiana Space Centre – located near Kourou in French Guiana, an overseas region of France located in South America. Located on the east coast of South America, Kourou has been used for orbital launches since 1970, when France moved operations of its Diamant rocket there from its previous launch site at Hammaguir in Algeria. In 1971 the European Launcher Development Organisation (ELDO) unsuccessfully launched its final Europa II rocket from the same launch pad that Tuesday’s launch will use. Europa’s first three orbital launch attempts – which also failed – and a preceding series of suborbital tests had flown from Australia’s Woomera Range Complex. The 1971 failure ended the Europa program, but not European collaboration in developing large rockets. In December 1979 the Ariane 1 rocket made its maiden flight from the launch pad that had originally been built for Europa, now designated Ensemble de Lancement Ariane (ELA – later ELA-1). Ariane 1, and the later Ariane 2 and 3 rockets continued to use the pad until the final Ariane 3 launch in July 1989, after which the complex fell into disuse. Work to rebuild the pad for Vega began in November 2004, with Vega’s maiden flight occurring in February 2012. In its role as a Vega launch pad, the launch complex is known as the Site de Lancement Vega (SLV). Tuesday’s launch was the eleventh flight of the four-stage Vega rocket, which was designed to carry payloads too small for the larger Ariane 5 and Soyuz rockets which Arianespace also operate from Kourou. The rocket’s first three stages are solid-fuelled, while the fourth stage – Avum – burns liquid propellant. To date Vega has completed all ten of its missions successfully: nine of its launches have been orbital, while Vega was also used for the suborbital deployment of the Intermediate Experimental Vehicle (IXV) for the European Space Agency. The upper stage used for the IXV launch briefly achieved orbit during testing following spacecraft separation. Italy’s Avio is the prime contractor for the Vega program. The current Vega configuration is expected to be replaced in the coming years by the upgraded Vega-C, currently scheduled for a 2019 debut. 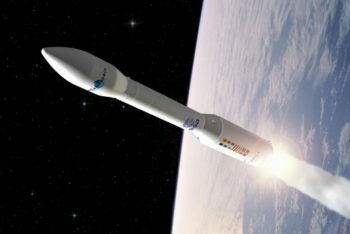 Vega-C uses a more powerful first stage derived from the Ariane 6’s boosters and a widened second stage to increase the rocket’s payload capacity. The Vega that conducted Tuesday’s launch had the serial number VV11. Build-up of the rocket began on 20 September with the transfer of the rocket’s first stage to the launch complex. Mohammed VI – A arrived in French Guiana on 22 September, and was transferred to the spaceport’s S3B processing building the following day. Following checkout, fuelling and mating with Vega’s payload adaptor, the satellite was encapsulated inside the rocket’s payload fairing on 23 October. On 26 October the spacecraft was mounted atop Vega at the launch pad. The final countdown for Tuesday’s launch began nine hours and ten minutes before Vega’s scheduled liftoff. In the hours leading up to launch the rocket’s key systems were powered up, with the multi-functional unit (MFU) that controls Vega’s electronics, turned on at the T-6-hour mark in the count. 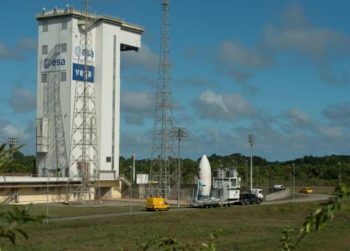 About three-and-a-quarter hours before launch, the mobile gantry used to assemble Vega at the launch pad began to retract from the vehicle – a process that takes around three quarters of an hour to complete. Once the tower was fully retracted to its launch position, the rocket’s guidance system underwent final alignment and checkout and the vehicle’s communications systems were activated. These events occurred 145 minutes and 75 minutes before liftoff respectively, with the rocket reaching launch readiness at the fifty-minute mark in the countdown. Vega’s first stage burned for about a minute and 57 seconds before burning out and separating. The second stage, a Zefiro-23 motor, ignited about six-tenths of a second after separation and burned for one minute and forty-eight seconds before it too burned out and was jettisoned. The Zefiro-9 burned for about two minutes and 42 seconds, after which it also separated. Vega then conducted a two-minute and twenty-nine-second coast before its fourth stage, Avum, ignited. Avum’s first burn lasted seven minutes and 45 seconds, placing itself and Mohammed VI – A into an initial parking orbit. The burn was followed by a lengthy coast phase until the rocket reached the apogee – or highest point – of its orbit. Avum restarted for its second burn, to circularise the orbit, fifty-two minutes and six seconds after liftoff. This second burn lasted one minute and 51 seconds. 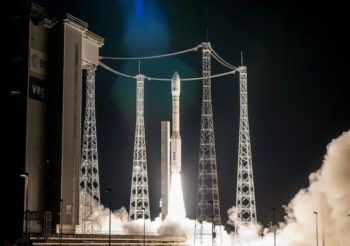 A minute and 36 seconds later, at 55 minutes, 33 seconds mission elapsed time, Mohammed VI – A separated from Vega into its planned sun-synchronous orbit. After spacecraft separation, Avum will make a final 78-second disposal burn to deorbit itself – this will begin one hour, 47 minutes and 44 seconds into the flight. Tuesday’s launch was the third and final Vega launch of 2017, and the tenth of eleven launches that Arianespace will conduct this year. 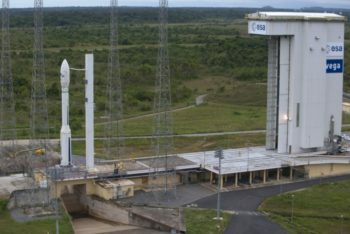 Arianespace’s last launch of the year is expected to use an Ariane 5ES rocket to deploy four Galileo navigation satellites on 12 December. Vega will next fly towards the middle of 2018 with the European Space Agency’s Aeolus climate research satellite.